I always tell my students "when nature calls, answer!" If you are in your kayak and out on the water how do you do it? There are a number of options available and a number of products you can use to help you in answering nature's call. Please refer to the October 2003 reflections "When Nature Calls" for information regarding the environmental considerations. The key to answering an on water nature call is the ability to stabilize your kayak so you can do whatever gyrations you need to do to expose yourself for relief. If you have a partner he or she can stabilize you in a number of different ways. If you are solo you will need some external support if you need to get up out of your seat. I am working on the assumption you will NOT be relieving yourself in the water. I will address ways to answer nature's call into some type of container. Since there are a number of different containers available we will focus on the method rather than the product. I have found the best way to stabilize your partner's kayak is laying over the kayak and grabbing the cockpit coaming with two hands while the kayaks are facing in opposite directions (bow to stern). Not only does it provide the greatest stability it allows you to watch your partner and react as needed and your body is out of the way of the cockpit. There are times where you may prefer not to see what your partner is doing. In such a case you can hold the cockpit while the kayaks are facing in the same direction Bow to bow). Your arms will partially block the cockpit opening but you and your partner can work around that minor concern. While this method works I don't find it as easy to stabilize as the bow to stern hold. If you have your kayak stabilized by your partner it will allow you to get up out of your seat. You can sit on the back deck which allows you to peel off some clothes and provide space between your legs for pouches and bottles. If you have on a full wet suit you may need to stand up to pull the wetsuit off before you can answer nature's call. The bow to stern stabilizing position mentioned above provides that stability. I recommend to only stand for brief moments and only if absolutely necessary. Sitting on the back deck is your best bet for staying out of the water. Here is an example of a Female Urinary Devise (FUD). It allows the female to have directional control by means of an anatomically friendly funnel with a six inch tube attached. It can be slipped under loose fitting shorts or you can peel layers as needed to position the devise and then aim the tube into a bottle or one of the new environmentally friendly collection bags. My wife told me of a female paddler who keeps their FUD attached inside their dry suit and opens her relief zipper and then positions her FUD when the time is right. If your cockpit isn't too tight sitting in the cockpit may work. My wife says it is better to sit on the back deck with her feet in her cockpit on her seat. Straddling your kayak with your buns directly over the water is the option I learned over twenty years ago. If you choose to follow the LNT guidelines mentioned in the October 2003 reflections you can still straddle the kayaks and hold one of the pouches or solid waste bags under you while you take care of business. Of the two options, I prefer not to look at my partner if he is spreading his buns over the water. The bow to bow position is preferred in this case. If you had to help your partner in some way then the bow to stern hold will be your best option. In this picture Rod is using the support of a paddle bridge. He is using a very strong paddle. In the world of light weight paddles I would be hesitant to use the paddle for any type of bridges or maneuvers where you sit on you paddle shaft. 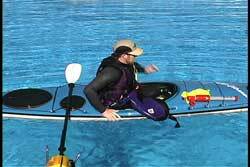 If you are solo then a paddle float can supply the support you need if you use it like an outrigger. Deck rigging gives you more options, so consider rigging your kayak as needed for solo paddling. Remember your goal is to answer nature's call and not end up in the water. I also hope you take into consideration environmental concerns in you choice of how you answer nature's call. You can visit the USK store for some of the devises mentioned here. Some of the pictures seen above were taken from the USK Video "Capsize Recoveries & Rescue Procedures"